You get a 'Thing' (aka art) in the mail!!!!!! Ummmm, want! 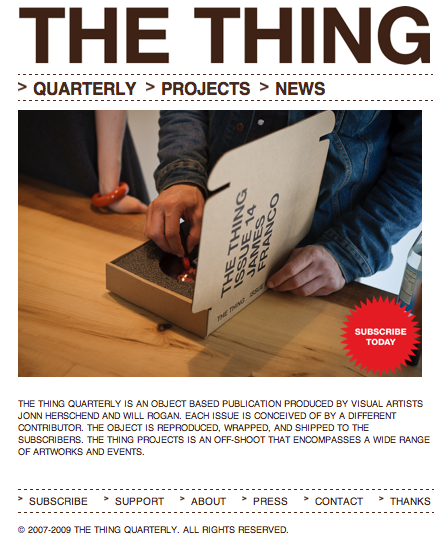 I’ve known about The Thing Quarterly for some time and have wanted a subscription. It would be PERFECT fodder for my art writing practice and I would accumulate some fascinating collectible art. John Herschend and Will Rogan struck gold with this innovative approach to art buying and collecting (and appreciating). A Dragon Dictate 2.5 that gives me complete command of my Mac using my voice? YES PLEASE! How RAD is this? How awesome is this? I’m wondering, does it give a fu*k about an Oxford comma? A new eye for my Canon...the bigger the better (seriously), in this case, size actually matters! Now, seriously, do I really need to explain the awesomeness of this t-shirt? You should know why I want it! Okay, I’ll stop here. I don’t want my Mom reading this post and thinking, “Some things don’t change. This is that same little girl who wrote 20 page letters to Santa – with pictures of all the things she wanted”. So, yeah, these are a few of the things I’ve wanted that give me a lot of inspiration and keep me writing and thinking about the world. Although one or two or all of these things may not be exactly connected to the day-to-day grind of writing (i.e., the t-shirt, for instance), the next big idea may bubble up to the surface whilst wearing or using said items. Posted in Art and tagged as postaday2011. Ha! These are great ideas for birthday presents. Nothing wrong with dropping a few hints, either 😉 It just makes it easier for loved ones to please you! Ha ha! I knew you would read this. Thanks, Omma! Honestly, I have EVERYTHING I need in my life but writing the post reminded me of when I was a little girl and you told me that our Santa didn’t have a lot of money and I totally believed you. Hee hee. Thanks again, Mom! Love you!